In 2006, San Francisco Beautiful recognized Yerba Buena Gardens with a Beautification Award. 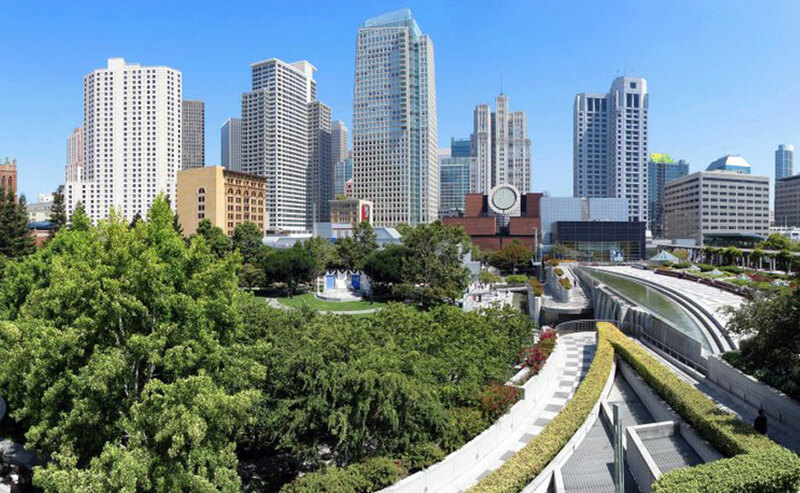 In the heart of SOMA and near the Financial District, Yerba Buena Gardens is a formal green space amidst bustling convention, visitor and business enclaves and a growing residential population. The Redevelopment Agency created Yerba Buena Gardens as a center for recreation, relaxation and culture. Integral to the Moscone Convention Center, its green space is surrounded by a performing arts center, museums, hotels, restaurants and stores and its children’s area features sports, rides, games and day care. The gardens are impeccably maintained and the area feels safe and secure. Enjoyed by visitors and residents alike, Yerba Buena Gardens has become an important San Francisco attraction.